The Royal Enfield Club of Australia (Inc.) aims to provide an association for like minded motorcycle enthusiasts; for interest, enjoyment, camaraderie and support. Classic motorcycling enthusiasts know that it’s not the destination but the journey that is important. The Royal Enfield Club of Australia (Inc.) and its’ members embrace this philosophy bringing Royal Enfield riders and riders of other marques together to celebrate the journey as well as providing help where necessary so that the journey can continue. The Rides tab will be largely dedicated to providing information on the rides I manage to participate in. I am also a member of Aussie Enfields, another great site for the discussion of all things Enfield and beyond, and a member of the Royal Enfield Interceptor Owners Group on Yahoo Groups. My Trip planner page is a blog, that will both be an update page as well as a bit of a riders diary. Please leave comments. 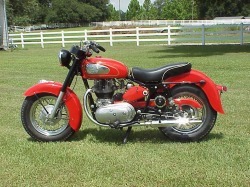 From time to time I will update various changes and modifications to my 1994 Enfield Bullet 500 in Progress Pictures. The picture above is of a 1959 Royal Enfield Indian Chief which I saw for sale on Craigslist in August 2009, a great looking motorcycle in my view. I hope to buy a Royal Enfield Indian Chief one day. If anyone has one for sale please contact me.